Atlantic Magazine writers, and husband and wife, James and Deborah Fallows spent four years and traveled more than 100,000 miles, visiting dozens of smaller American cities trying to find the other story. We all know the main story: America’s small cities are failing, often spectacularly. Youngstown is often used as a prime example; Warren usually gets spared by being too small and too close to be used as a second example. The Fallows set out looking for cities that had suffered a serious blow — usually economic, like the disappearance of an entire industry. They visited nearly 50 cities for a minimum of a few days each, and sometimes for weeks at a time. They visited several of them multiple times and interviewed as many community leaders, and regular folks as they could. The result of their epic journey and insightful reporting is: “Our Towns. A 100,000 Mile Journey Into the Heart of America.” This is the book for those of you who think the media only looks for bad news. “Our Towns” is jam packed with examples of what’s going right in America’s smaller cities. This topic has fascinated me since I began writing Warren Expressed in 2011; I’ve read extensively on the topic and nothing has given me more hope for the future of Warren than this book. And it is like medicine that tastes good. It’s good for you. You’ll learn a lot from it, but it’s like eating chocolate chip cookies as you breeze through visits to the spiritual American heartland, from Greenville, South Carolina to Chester, Montana, to Erie, Pennsylvania, to Riverside, California, Bend, Oregon, Duluth, Minnesota and many more places between. What makes this book chocolate chip cookies and not a bowl of Brussel sprouts, is the power of great story telling. There are some statistics in “Our Towns” but they’re only there to advance the narrative. 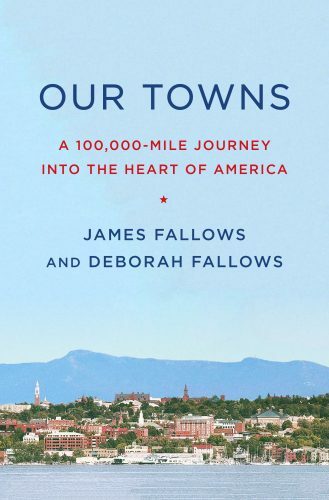 The Fallows split up in each city and visited business and government leaders, school administrators and scores of “local patriots” who simply refused to allow their community to sink into oblivion. These are towns that fought back and won — or at least are winning more battles than they are losing. They work together. They allow their creativity to flower. They take chances. They welcome new comers. They look to the future, not to the past. These are the cities we should emulate. These are the stories of success and leadership we should tell each other. These are stories of the people and places that prove we can do it too. “Our Town” ends with a handy list of the “10-1/2 Signs of Civic Success” they learned in their travels. It is worth the price of the book alone. And take heart; number 10-1/2 is: “A city on the way back will have at least one craft brewery.” That’s now a check mark for Warren. If you’d like to know more, CBS recently ran a profile of the book and its authors; there is also a web site for the book. Posted Tuesday, May 29th, 2018 under Economic development.